The cell adhesion pathway is among those affected by newly discovered mutations in gene promoter regions within pancreatic cancer cells. This image of cancerous pancreatic tissue shows how relatively healthy cells, stained red, remain clearly marked by junctions (stained green) at which adjacent cells adhere to one another. Much of the upper right side of the image is populated by proliferating cancer cells (each blue dot represents an individual cell nucleus). Most of these cells have lost their ability to adhere to one another. This is a harbinger of metastasis. Credit: Michael Feigin, Tuveson Lab, CSHL. Pancreatic cancer researchers found previously unspotted mutations in promoters, portions of the genome that regulate when genes are active. The genes they affect impair pathways known to be involved in the illness. 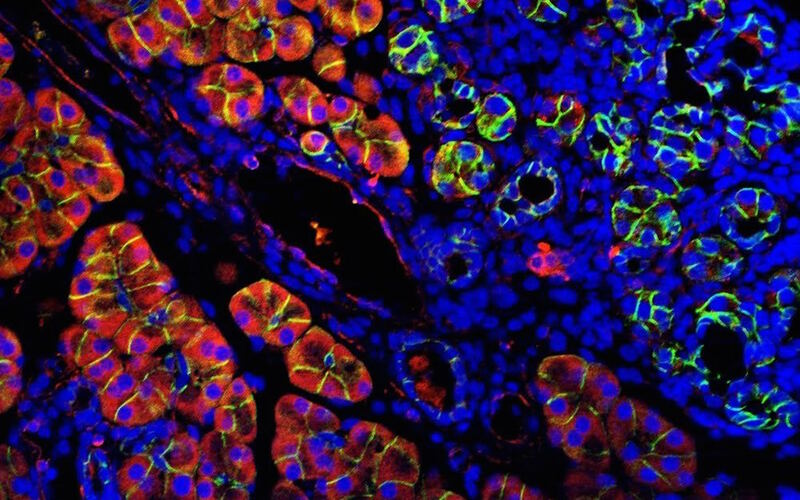 Cold Spring Harbor, NY — By closely studying a part of the human genome that has not yet been carefully scrutinized in studies of cancer, researchers at Cold Spring Harbor Laboratory (CSHL) have found important new clues to the development of pancreatic cancer. The researchers looked exclusively at small segments of DNA called promoters in samples of tumors taken from 308 pancreatic cancer patients. Promoters are typically located adjacent to genes that they have a role in regulating. An activated promoter can, for example, switch “on” the gene it sits next to. One of many causes of cancer are genes that stay “on” for too long, bypassing natural signals to shut down. This is one way cancers grow out of control. Promoters are invisible in studies of cancer that look only at genes in our chromosomes that contain the blueprints for making proteins that our cells depend upon to function. Incredibly, only 2% of the human genome—called the “exome”—is made up of these protein-encoding genes. Promoters are in “the other 98%” of the genome, not often looked at in cancer studies to date. The team found something they did not expect. While they spotted mutations in promoter regions in the genomes of pancreatic cancer cells, “these mutations weren’t near any of the genes that prior research had already told us were typically mutated in pancreatic cancer,” says Michael Feigin, Ph.D., a postdoctoral researcher who led the work in the lab of CSHL Professor David Tuveson, M.D., Ph.D. Dr. Tuveson is Research Director of the Lustgarten Foundation and Director of CSHL’s Cancer Center. Genes called KRAS and p53 are mutated in the majority of pancreas cancer cells, for example. But the mutations the team discovered in promoters were not near these or other known pancreatic cancer genes. While the promoter mutations were not near known pancreatic cancer genes, the team discovered that they affected some of the same biological pathways inside cells. Prominent among these were promoters affecting pathways that control cell adhesion and axon guidance. Cell adhesion pathways help determine whether cells stick together or can fly free of the tissue in which they live. Cancerous cells that do not adhere to moorings in tissue can become the seeds of metastasis — the often deadly situation in which loose cancer cells colonize other parts of the body. The axon guidance pathway associated with promoter mutations is implicated in the involvement of nerve cells in pancreatic cancer. “In pancreas cancer, nerves are often attracted to or get attracted to the tumor,” explains Feigin, “and sometimes they grow right through the tumor. This is one of the reasons pancreas cancer is so painful.” Tumors, he also notes, can actually spread via nerves; this is called peri-neural invasion. It’s possible, Feigin says, that axon guidance signals—and indeed cell adhesion signals—“are actually being used by tumor cells” to gain advantages over healthy cells. A question naturally arises: if these and several other pathways were already implicated in pancreatic cancer, what is the advantage of the new knowledge about promoter mutations? The answer, the team explains, has to do with finding ways to fight pancreatic cancer, one of the major cancer types that remains profoundly resistant to all existing treatments. The more that is known about defects in specific pathways in specific cancer types, the more specific molecular targets—pathway components—appear in the sights of researchers trying to disable or enhance a given pathway. 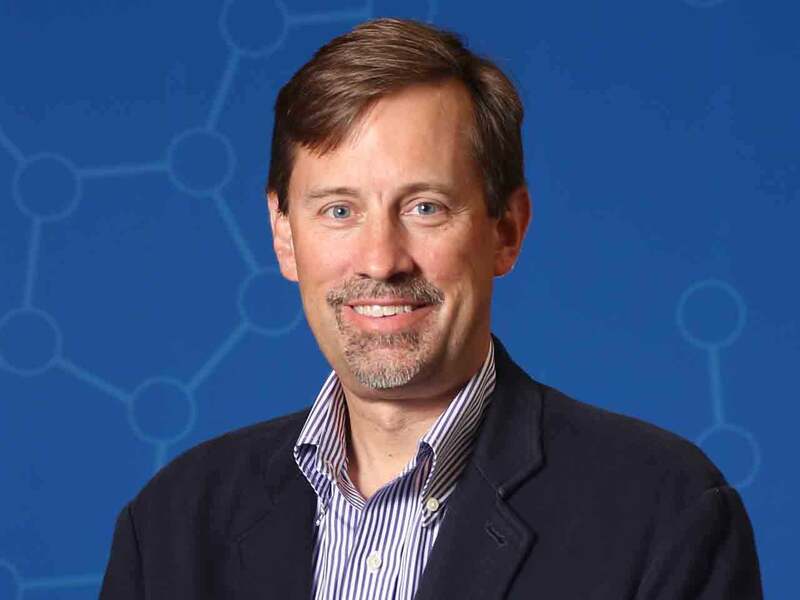 The new data thus “adds depth to our understanding of things that go awry in these critical pathways, sometimes promoting cancer formation, other times providing cancer cells with advantages that enable them to crowd out healthy cells,” comments Dr. Tuveson. The research discussed here was supported by The Lustgarten Foundation, Cold Spring Harbor Laboratory Association, the V Foundation, and the David Rubinstein Center for Pancreatic Cancer Research at MSKCC. Other support was provided by the STARR Foundation, DOD, Louis Morin Charitable Trust and the National Institutes of Health.